This guide is for the console version. For the PC expansion pack, see The Sims 2: Pets. For the Nintendo DS version, see The Sims 2: Pets (Nintendo DS). For the Game Boy Advance version, see The Sims 2: Pets (Game Boy Advance). 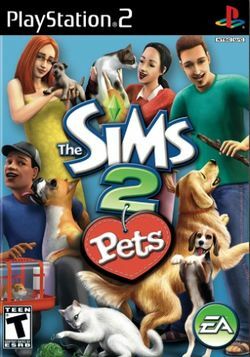 The Sims 2: Pets is the second The Sims 2 port for consoles. Unlike the PC version it is not an expansion pack but is instead a standalone game. The main focus of this game is on pets. Werewolves do not appear in this game. The console versions of this game involve the upgrading of the town square which grows larger as you utilise it more, and the GBA version involves you making a career in pet care. The PSP version of the game plays similary to the console version except for a few small differences such as the fact that you can only use predesigned templates for your sims house and a few exclusive objects. The Wii version plays just like the GameCube and PlayStation 2 version and doesn't offer exclusive Wii gameplay in terms of the remote. There is also a connection between this game and the PC version in that codes unlocked in the expansion pack can be used to unlock pet parts in this version. This page was last edited on 24 October 2009, at 19:58.